My father was a wonderful man and my mother was more wonderful still. 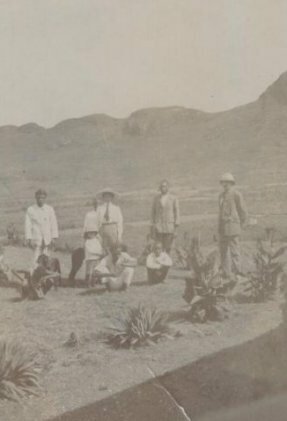 They met in South Africa just before the start of the Boer War [1899-1902]. 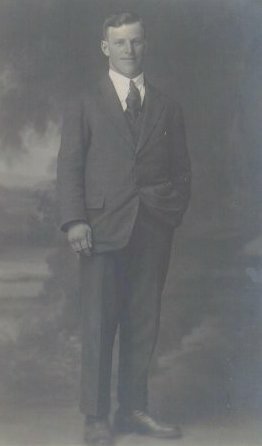 When Dad was seventeen years of age his father sent him out to Queensland, Australia, for colonial experience. He worked for a big squatter in the Darling Downs, incidentally a rogue and a vagabond. I remember Dad saying a young fellow [by] the name of Robertson had put a lot of money into the place and then was told that he had no legal share. After twelve months Dad left and for a while worked on a boat bringing down Kanakas [South Pacific Islanders] to the [sugar] cane cutting fields of Queensland. His next stop was South Africa where he joined the Natal Mounted Police. Dad was an excellent horseman and was one of the four troopers who won Bubesco Trophy. When the war started in 1899, Dad joined Thorney Crofts Mounted Infantry (the tenth regiment raised in the colony). Both Dad and Mum were well educated. Dad went to school in France and could speak French fluently. Mum (Beatrice Graham) was one of a family of eleven and came from Yorkshire. I have a photograph of her father (The Town Clerk of Halifax) taken at the Diamond Jubilee of Queen Victoria in 1897. 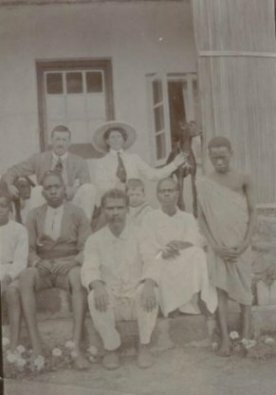 When her father married again the family split up and Mum and her two sisters, Polly and Kate, went out to South Africa. Mum was very good at commercial French and German as well as accounting and could get a job anywhere. It was marvellous that she was able to put up with the bitterly cold weather in those early days in Canada. With only a log cabin, Eric as I have mentioned earlier was born on the farm. 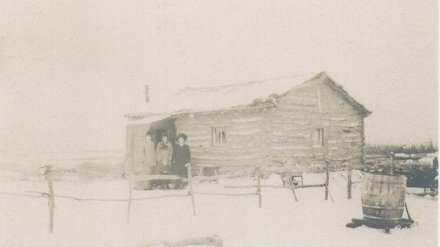 Figure 25: The Graham Family Log Cabin near Jasmin, Saskatchewan, Canada. This photograph was obviously taken during winter in the Northern Hemisphere (December – February) given the snow. Pictured at the entrance to the cabin are three women and a young child. Their dress and appearance indicate that they may have been the “Aunts”, as Keighley liked to call them, Anna Butler, Henrietta Butler and Beatrice Graham (affectionately known as Aunt Bee). Although I have tried my very best I have not been able to persuade any of my family to come to Australia. Eric was in the evacuation of Dunkirk and was right through the last war. Mum’s maiden name was Walton. Getting back to myself. The Aunts when they heard that I was going to Australia tried to get me to land in Western Australia. They knew someone influential who knew the Agent-General of Western Australia. But I was already booked for Melbourne, Victoria, so there was nothing they could do about it apart from keeping the address. My first job in Australia was at Newstead Victoria with some very nice people, the Galvenars. I did not stay there more than twelve months as I wanted to be able to start on my own as soon as possible; little knowing that we were approaching the worst depression that the world has known. Actually 1928 was the last of the good years and things did not begin to improve again until about 1935. Anyway in April 1929 I decided to come over to Western Australia. At that time I had a job at Darrawest about thirty miles from Melbourne. My passage was booked on the “Dimboola” (they used to call it the “Damn bowler” as it rocked both ways). I travelled third class (steerage) £6 to Fremantle. 2nd was £9 and 1st was £12. We arrived at Fremantle on 6 June 1929. At that time there were two thousand men sleeping on the wharf at Fremantle and on our boat, the “Dimboola”, of the state shipping service there were men from all parts of the eastern states and New Zealand leaving the place like rats from a sinking ship. Personally, I had the address posted to me by my Aunts who had left me with the urge to come to Western Australia so I took the train at 6:30 am next morning for Irwin Downs station in Geraldton. When I got there the following morning with a letter for the manager, I found that Mrs Scroope had long since past on and the manager had gone also to be replaced by another … who knew nothing of me at all. Anyway he lent me a tent and gave me a contract clearing a stock route. I was there about four months and when I left I swapped the Manager’s tent for all my rabbit traps. Apart from the contract, I used to trap rabbits at the time [for the skins]. Well, it was then almost harvest time so after spending a week or two at Dongara Beach, I went to Geraldton and eventually to Northampton. By 1930 things had got very bad indeed and jobs were few and far between. The wheat farmers of Western Australia at the time only employed people at seedtime and harvest. You can imagine I never had a good opinion of the wheat farmers in those days. I have slept on wheat sacks, walked miles after a job, but nevertheless was very seldom out of work. In 1931, I got into the orchard-growing district of Kalamunda and from then on used to take clearing contracts in the summer. The orchardists in those days were much more efficient than they are now and paid to have trees dug round in the spring (3p for small tree and 6p for a big one). So that it came about that day that I was reading a paper four days old and saw the blocks of land offered for sale at Mount Helena. “Water at shallow depths; land from £1 - £3-15s per acre and ten years to pay it in at 4%.” So instead of clearing for somebody else, I decided to start clearing for myself. On 3 November 1933, I paid the deposit on this place and quarterly instalments thereafter.